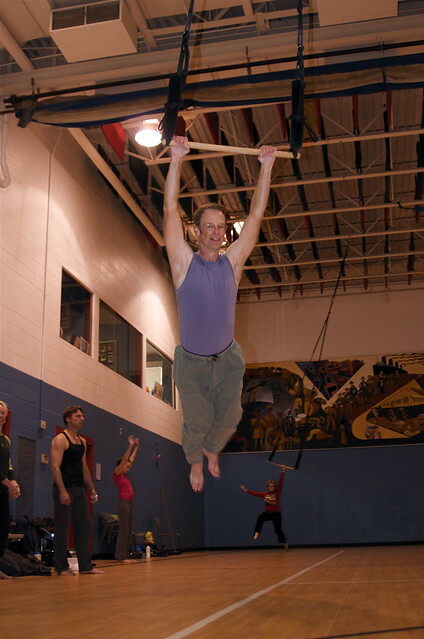 On Sunday I mentioned in my post that we had held our aerial dance class in the gym this week and had multiple apparatus rigged. I had the opportunity to take a few photos between drills. Individual warm up gets things ready for class. Fearless leader Linda taught class. Here she is standing in the center of the cone described by the orbiting Luv. The point was to get comfortable with the orbit and learn to gauge when to successfully merge with another dancer who is already in motion in the air. By the end of the class, most had a pretty good idea of the mechanics of the activity and time plus repetition will hone all our skills. It is one thing to get the mount and quite another to get it and make it look both effortless and pretty. Here Luv and Laura have nicely demonstrated the skill, sharing the bar and making themselves useful as hand-holds and leverage points to assist the other. It was a fun class, and I hope we continue to work on this material.